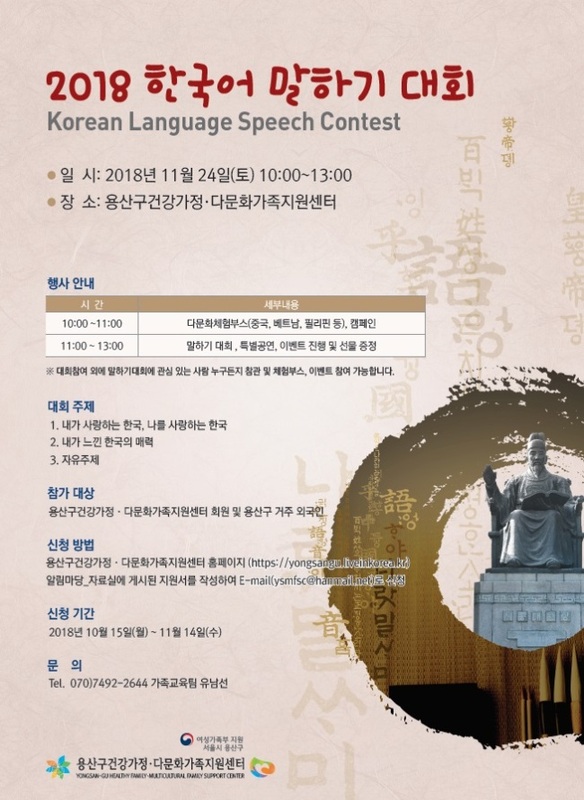 A Korean-language speech contest will take place on Nov. 24 at the Multicultural Family Support Center in Yongsan-gu, central Seoul. This is the fourth year the contest will be held. Twelve expatriates who pass a preliminary round of evaluation will be invited to speak at the final competition. Participants are to write their own speeches on topics concerning why they love Korea and what about Korea draws them to like it. The occasion will serve as a chance to think about how policies in Korea for multicultural families can be consolidated. Anyone can enter the contest until Wednesday. More information can be found on the culture center’s website at http://yongsangu.liveinkorea.kr.